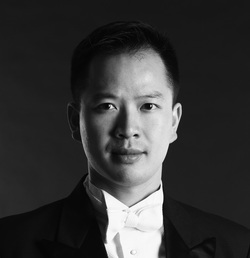 Praised for his "deft" conducting (San Francisco Chronicle​), Tam appears frequently with choral and orchestral ensembles. Recent engagements include collaborations with Ars Minerva, Bay Pointe Ballet and Oakland Ballet. A specialist on historical keyboards, Tam has been lauded as "a master of [the harpsichord]" (San Francisco Classical Voice). Recent concerto appearances include performances with Elevate Ensemble and the Modesto Symphony. In addition to performing as a soloist, Tam is a founding member and the harpsichordist of MUSA, a San Francisco-based Baroque ensemble. He has also served as principal keyboardist for the symphonies of Merced, Modesto, Napa Valley, Santa Rosa, and Santa Cruz. Tam currently serves as the Director of Music at First Congregational Church of Berkeley, one of the major performances venues for classical music in the East Bay. He also is the Artistic Director of the Star Valley Children's Choir (SVCC) and is the Music Director of the Berkeley Community Chorus Chamber Singers. He currently chairs the Youth Advisory Board of Early Music America. Visit his website at www.dereksaihotam.com. Between performing Couperin, Schumann and Messiaen on all sorts of historical keyboards, Derek answers some questions on his favorite word, early music and more. A: The "ding" on my phone that tells me that I've received a new email...sort of. A: My childhood teacher, Jing Xu, who instilled within me a lifelong passion for music. A: To write down all of his music that has been lost in the intervening centuries. Q: What is the most surprising thing you wouldn't have expected before getting into early music? A: How frequently I have to move harpsichords. A: Fin de siècle Europe. A: I don't have a case, but it's always nice to find a spare pencil in the harpsichord. A: Among Baroque composers, I've recently been very interested in the works of Matthias Weckmann.